"The best online source of information about Quantum Leap and its stars." W H A T ' S ��� N E W ��� H E R E ? September 4, 2002 - LadyK is moving her story Baby Blues forward with part IV now available on the fan fiction page. May 23, 2002 - Susan Johnson has brought her story A Stitch In Time to a close with chapters 24 - 32. April 30, 2002 - Four more chapters (20 - 23) of Susan Johnson's story A Stitch In Time are now available on the fan fiction pages. Enjoy! April 27, 2002 - Part III of Baby Blues by Lady K is now available on the fan fiction pages. April 22, 2002 - Part II of Baby Blues by Lady K is now available on the fan fiction pages. April 15, 2002 - Chapters 14 through 19 of Susan Johnson's story A Stitch In Time are now available on the fan fiction pages. The new story Baby Blues by Lady K is now underway with Part I coming in over the weekend. April 09, 2002 - Chapters 10 through 13 of Susan Johnson's story A Stitch In Time are now available on the fan fiction pages. March 07, 2002 - Three more new chapters of Susan Johnson's story A Stitch In Time are now available on the fan fiction pages. March 05, 2002 - Three new chapters of Susan Johnson's story A Stitch In Time are now available on the fan fiction pages. February 20, 2002 - Susan Johnson has sent us the first three chapters of her new story A Stitch In Time. February 15, 2002 - Lady K. has started a new story called Baby Blues. The Prologue is now available on the fan fiction page. January 31, 2002 - Part V of Lady K's story School Daze is now available on the fan fiction page. January 15, 2002 - Part IV of Lady K's story School Daze is now available on the fan fiction page. January 7, 2002 - Part III of Lady K's story School Daze has arrived. January 5, 2002 - Part II of Lady K's story School Daze arrived while I was away on vacation. It is now available on the fan fiction page. Enjoy. December 20, 2001 - Lady K has sent us the first part of her new story School Daze. Check it out on the fan fiction page. December 17, 2001 - Benjamin Fields has sent us part 7 of his script The Leap Forward. On March 26, 1989, Quantum Leap debuted on NBC as a mid-season replacement series. The series centers on the adventures of the multi-talented quantum physicist Dr. Sam Beckett (Scott Bakula) whose time travel experiment has gone awry. A spin-off of the the mysterious ``Starbright Project'' (an effort to build an interstellar drive), Project Quantum Leap was developed in order to send person traveling through time. Theorizing that one can time travel within the span of one's own lifetime, Dr. Beckett's theories are brought into reality in a top secret project hidden deep in an mountain somewhere in New Mexico. On the verge of losing funding for the project, Sam sends himself back into the past exchanging places with a young US Air Force test pilot, demonstrating beyond any doubt that Project Quantum Leap is a success. Although the project keeps its funding, its principal investigator can't be brought home. Due to the failure of the retrieval system, or perhaps due to the intervention of a higher power, Sam finds himself leaping through the years from life to life, moving on only when he puts right what once went wrong in each person's life. Time travel is not easy for Sam Beckett, especially when you can't control where you might end up next. As an added complication, leaping messes with your mind. Although Sam usually remembers who he is after a leap, parts of his memory get scrambled each time, making it difficult for Sam to remember previous leaps, skills he possesses, and information he may have already known about the current time period (the swiss-cheese effect). Sam is assisted by a support team anchored in the ``present'' (the late 1990s). Rear Admiral Albert Calavicci (Dean Stockwell) is the Observer and he's also Sam's best friend. A small amount of neural material collected from both Sam and Al allows Ziggy, the semi-sentient, hybrid supercomputer to track Sam through time. While he is in the Imaging Chamber, Ziggy can project a holographic image of Sam's time period around Al. Sam, in turn, can see an image of Al in his own mind. Through the handlink to Ziggy (a palm top data terminal) Al can provide advice and information to Sam which will help him determine the nature of his mission and then complete it. Exactly what Sam is supposed to ``put right'' each leap often remains a mystery well into each episode. When Sam leaps, he trades places with someone in the past. That person ends up in the ``future'' in the Project's Waiting Room (often scared and confused) while Sam takes their place. People in the past don't see Sam Beckett, they see the person he is replacing. Small changes for the better in the lives of seemingly anonymous people will often have major repercussions on significant historical events in our recent past. Quantum Leap was a successful television series. It ran for 4 and 1/2 seasons for a total of 95 episodes (including multi-part episodes) on NBC. During its run, Quantum Leap won numerous awards (5 Emmys and 2 Golden Globes) and enjoyed good ratings. The show was suddenly canceled by NBC after the end of season 5. Now the subject of great debate amongst its fans, the last episode of Quantum Leap, the infamous Mirror Image, was intended to be a season finale cliff-hanger. With the announcement of the show's cancellation well after the filming and much of the editing of Mirror Image was complete, the episode was hastily re-edited to turn it into a series finale. Although the episode was originally designed to address many outstanding questions about Sam's leaping, it raised many more new questions that it answered. Many fans were, and still are, unsatisfied with Mirror Image. There have been numerous requests over the years for a TV movie (or even a feature film) to bring proper closure to the series. Quantum Leap can still be seen world-wide in syndication. The show continues to pull in new fans. Since its cancellation, over a dozen novels based on the series have been published and several non-fiction books documenting the series can be found in bookstores. Numerous fan clubs and World Wide Web sites devoted to the series show that Quantum Leap fandom is alive and well. M E S S A G E ��� B O A R D The message board has closed due to lack of interest. 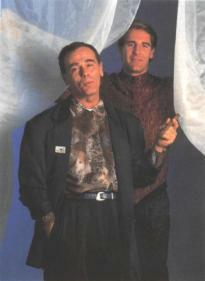 The Quantum Leap Fan-Fiction Archive contains contributed fiction set within the Quantum Leap universe. Many stories in this archive fall into the category of "work-in-progress", so you should check back often for new chapters. If you are interested in submitting a story to this page, please read the submission guidelines. New contributions are always welcome. If you would like to comment on stories presented here, please make use of the message board. Authors love feedback. Please note that all stories appearing in this archive are protected by the appropriate copyright laws of the United States of America and those reciprocal agreements the United States has with other countries. You must seek permission of the author before using all or part of any story appearing on this page. Information about the show and its stars written and/or compiled by fans. New contributions are always welcome. All documents are local except those designated by ``(LINK)''. E � P � I � S � O �D ��E ��� G � U � I � D � E Here's your guide to every episode in the series. Tabulated are the original broadcast dates, the official episode title, the leap date (where Sam begins the episode in the past), writer - director - cast information, notes on awards, and an episode summary. Scans of promotional pictures or screen captures from Quantum Leap. The sole purpose of the images on this page is to promote interest in the show. This page prefer to only make available good quality scans and screen captures. If you prefer to see thumbnails of each picture before downloading, follow the ``thumbnail'' links below. Click on the thumbnail to get the full-sized image. Most of the images are stored in 24-bit JPEG format, through some may be 8-bit GIF format. If you prefer a simple text listing of images, a link has been provided below. For those of you who might be looking for issues of the Quantum Leap comic book series published by (the now defunct) Innovation, the QLIK provides here most of the covers from that series. Phil Zeman's Quantum Leap Comic Guide (January 19, 1995 version) is available H E R E.
The Quantum Leap Information Kiosk is happy to provide space for Alpha - Barbara Walton's Quantum Leap Pages, a collection of information for writers. By hosting her pages we insure that Barbara's unique contributions to Quantum Leap fandom will not be lost. On May 27, 1997, Donald Bellisario made a scheduled appearance on Universal Chat to answer some questions about his past and present work on various shows including Quantum Leap. This was a moderated chat session and questions had to be submitted in advance. Only a small subset of the submitted questions were addressed by Don, having been selected from the whole by either the moderator or Don himself (who selected the questions that were answered remains unclear). I am pleased to say that a question submitted by the QLIK maintainer was selected for this interview. Disclaimer: Universal Chat is the property of Universal Studios. The Quantum Leap Information Kiosk has no affiliation with Universal Chat or Universal Studios. The transcript of the Universal Chat session with Donald Bellisario is provided by this site as part of its general mission of promoting interest in the television program Quantum Leap. Kristy's QLIK Leapers Photo Album Leapers Photograph Album - Here you can find pictures of some of the folks who post pictures and comments on the Quantum Leap Information Kiosk. Latest Scott Bakula Appearances What's the former star of QL doing now? AJ's Quantum Leap Fan Fiction Library Strictly fan fiction based. Links to other fan fiction, and a collection of fan fiction written or co-written by AJ Burfield. There are many other sites on the net dedicated to Quantum Leap not included in this list. Many of these sites you can find via links on the sites listed above. Most are pretty lame. A lot have disappeared from the net (a phemomenon now called ``link rot''). Several otherwise worthy sites have HTML or JAVA coding that crashes my web browser. A few truly good sites ask that this page link to them, but don't provide a link back here in return. I will not link to your page if you will not link to mine! Do you have a worthwhile site that you want to share with others? Are you willing to link back to this site? Send me (Go-Captain Alvarez) your URL and I'll have a look. I'll add any good site to the list. Quantum Leap is the property of Belisarius Productions and Universal Studios. This is an fan produced, fan maintained, noncommercial website dedicated to promoting interest in this show. This site has no affiliation with Belisarius Productions or Universal Studios. (what the heck is a ``Go-Captain''? Read the works of Cordwainer Smith and be enlightened). This version of the QLIK is dated December 4, 1999 and will likely be the very last incarnation of this WWW page.